Free space on the end of your Cashwrap? 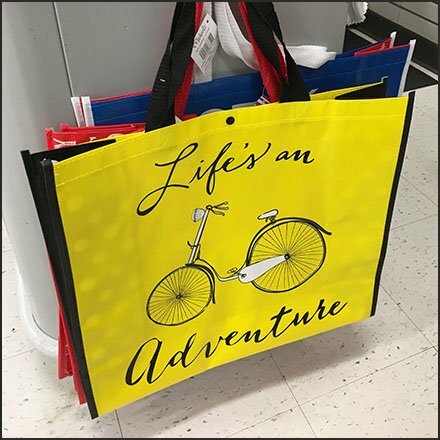 Try this Life’s An Adventure Branded Bag Pin-Up Hook concept for a final out-the-door sales pitch of re-usable shopping bags via Command Strip accessory. This Life’s an Adventure variant is a lifestyle spin on re-usable bag use. Why not look good as you lug your merchandise home. And with this you might meet a fellow bicyclist to boot. This Life’s An Adventure Branded Bag Pin-Up Hook cash wrap concept seen at Michaels. “Bicycle Store Fixtures Pinterest Board“ for a visual summary.